UAL has been recognised for the extra lengths we go to in order to support the mental health of our students and staff. 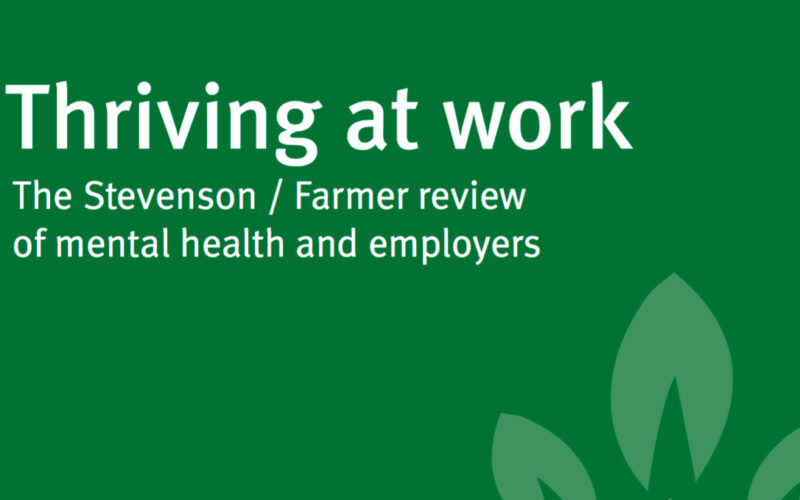 This came in the form of being asked to contribute to The Stevenson / Farmer review of mental health and employers, entitled ‘Thriving at work’. I followed this up this request by writing to Lord Stevenson, outlining the importance of protecting mental health and explaining what we are doing to lead the way in the higher education sector. As well as a significant increase in financial resources, we have worked with the Arts Students’ Union to develop a Mental Health Action plan from 2016–2020 to help our staff and students work to the best of their ability and crucially maintain a healthy lifestyle. We also have other measures, including training mental health first aid training for staff, which I believe outline our commitment to student welfare. To read the full report, please click the link here. UAL was asked to contribute to the investigation into mental health in the workplace. UAL is a workplace for students as well as staff – measures which support student mental health also support staff mental health. UAL works with our Arts Students’ Union on mental health, and we have put in place a Mental Health Action plan 2016–2020. Mental health issues typically surface by the mid-20s, exactly when people are setting out in their career. If a business recruits young people in any significant number, it faces the same issues as a university and has the same responsibilities. Traditionally, young people are expected to prove themselves when they enter employment. As such it is important that employers focus on outcomes rather than proxies such as long hours which may exacerbate mental health problems. Mental health issues are experienced by the individual but shaped by their environment, in this case the workplace. Employers therefore need to create the right environment in advance rather than tackling this when individuals display problems. Everyone is somewhere on the mental health spectrum, so this is a business productivity issue which should be dealt with alongside other health and safety considerations. Creating a positive environment for mental health is likely to cost less than failing to do so. While not everyone will choose to disclose, staff are encouraged to inform us of any ongoing condition when they start work at UAL. We then assess their support needs, aiming to avoid a situation where they might not be able to cope at work. Starting in academic year 2013-14, UAL has put support in place much earlier when staff report illness related to stress debility and depression. At the same time, we increased our focus on managing long-term sickness more effectively. By the following academic year, stress debility and depression as a percentage of total absence had already fallen from 26.96% to 23.38%. Mental health absence improved most as a subset of this — from 3.69% of total absence to 1.54%. In 2016-17, we rolled out a staff development programme on student well-being, training a number of mental health first aiders at almost all sites. These staff are mainly administrators as they need to be able to leave their work to deal with an incident. This initiative focuses on students, and it has increased perceptions of mental health support generally. Managers are supported directly by HR and through a Manager Support service which provides advice on managing staff with mental health issues. Our coaching scheme is also designed to support managers on this issue. UAL aims to ensure our policies work effectively to support people with an ongoing condition to return to work and stay in work. To achieve this, our main policies include flexible working and sickness absence, including return to work support; the staff charter; the Occupational Health team; and the Access to Work scheme. Staff with a mental health condition that is considered a disability are encouraged to contact Access to Work, as part of making reasonable adjustments. Through this, they have access to services designed to support them to stay in work. The assessor will suggest support and adjustments and help an employee to have a conversation with their manager or others about their needs. There are two notable considerations in the management of mental health. The biggest problem is the absence of reliable data or an accepted common definition of mental health. This may make it difficult for businesses to assess workplace mental health, understand their responsibilities and benchmark the level of support they should put in place. The second problem is an emerging generational gap in understanding of mental health. The stigma has been reduced among young people through secondary school teaching focusing on earlier disclosure. They are therefore more likely to recognise and disclose mental health needs when they get to university and into the workplace. Mental health awareness needs to improve among the whole working population not only to increase recognition and propensity to disclose needs, but also to forestall intergenerational misunderstanding in the workplace.